VCAT has been set up with validation steps to guide you and facilitate the process. Those steps have been incorporated into five tabs; from Validation Issues, Educator Courses, Missing SECT Data, Valid SECT Data, to the Submit Data tab. • Login to VCAT, go to the A tab, click on SECT. • Select the school (one school at a time - repeat these steps for each individual school). This tab only shows if any validation issues are found. It provides you with a list of issues that need to be addressed before proceeding to submit your SECT reports. The State only allows for 1 (and only one) Teacher of Record per section. If a section has more than one teacher of record assigned to a section in VCAT, for example, the system will tell you and will also provide you with the name of the section(s) so you'll know which ones need to be fixed. Other examples of issues you might find in this step are students and/or educators missing their state ID. In order for those students and/or educators to be part of the reports, their state ID must be entered in VCAT. Students listed as missing their State ID will be excluded from the SECT reports, unless their State ID is entered in VCAT and Educators listed as missing their State ID will be excluded too - and so will the courses they teach and their students data. • Go to the Data tab. • Click on the current school year. • Click on Student List. • In the Search field of the filter section at the top, type in the last name OR the first name. • Press Enter or click on the Filter button on the right. • Click on the Edit button in front of the student you are interested in. • Under the Information tab, type in the student's state ID in the State ID field. • Hit the Save button on the bottom left. • Click on Staff List. • Click on the Edit button in front of the educator you are interested in. • Under the Information tab, type in the educator's state ID in the State ID field. Once you have fixed the issues, go back to the A tab in the SECT section and click on Validate again. It will rerun the SECT reports with the updated data. This tab provides you with the list of all educators part of the SECT reports, with their role and each course they teach. This is the perfect opportunity to review that information and make sure it all makes sense. If you'd like to sort by a particular column, just click on the blue header of that column. IMPORTANT: Only educators assigned in VCAT with a role that has a code of 10, 20, or 30 are included in the SECT reports. The code determines if the educator is a 'Teacher of Record' (10), a 'Co-Teacher of Record' (20), or an 'Other Contributing Professional'. NOTE: I find very helpful to set the numbers of items per page to have all of them on one page, then I click on 'Local Name' header. It will sort by subject and grade. I can quickly glance and see if any grade and/or subject are missing which would indicate that SECT curriculum links might be missing. If this is the case, I verify the curriculum links. If you notice an educator whose assignment is incorrect, you need to edit his account to make the correction. This tab lists the 'missing' data, based on where there should be SECT data (courses linked to SECT curriculum). When you know that all your data has been entered but VCAT still displays 'missing' data, you should review that list and look closely at the students and the courses for which they are missing data. Often, the students missing data are students that have left early in the year and do not have data. In this case, there is no need to worry about them. All the 'missing' data will be left out (excluded) of the final SECT reports. On the other hand, if you notice students that should have data, this gives you the opportunity to investigate why they are showing up without any data and make sure that data gets entered for them. NOTE: I find very helpful to set the numbers of items per page to have all of them on one page, then I click on 'Local Name' header. It sorts by subject and grade. I can then quickly glance and see if the missing data is concentrated to a specific subject and grade, or just limited to a student here and there. If it is concentrated to a specific subject and grade, it could mean that the teacher hasn't entered her SECT data or, for some reason, the supporting data feeding into the SECT data isn't coming through. Either way, you will need to investigate. In a readable format (compare to the official .csv State files), this step shows you the list of all the data part of the SECT reports. Due to the new Vermont Automated Data Reporting (VADR) and Statewide Longitudinal Data System (SLDS), submission this year will NOT function as it has in the past. You will NOT submit this data directly to the State via this tab. When your VCAT SECT data is ready, we will import it onto our Main VHub system, to be used in the new official Year End Data Collection part of the State Vertical Reporting (VR). This tab allows you to directly upload your SECT reports to the State! 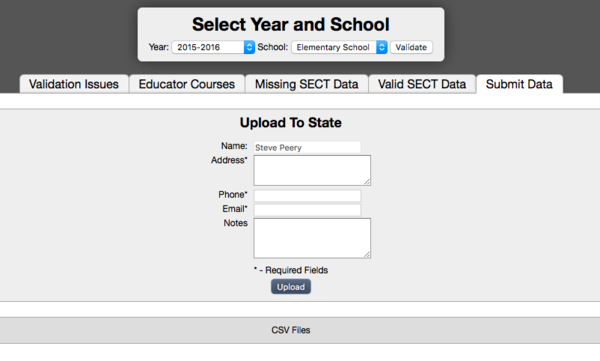 Fill in the required fields (Address, Phone, and Email) then click on Upload to upload your SECT reports directly to the State. Within 1-2 days to a week, the State will contact you via secure emails with an error report (if any), or the signature pages when all has been accepted. If you ever need to download the School Courses File and the Student Transcripts File, you can do so by clicking on CSV files. This page was last modified on 13 June 2018, at 15:45.